As inflammation worsens, appendicitis pain typically increases and eventually becomes severe. Abdominal pain is the hallmark symptom of appendicitis. What can confuse people, though, is how the pain starts and can change. Most people associate appendicitis with right lower quadrant pain (the right lower side of the belly) but overlook the fact that the pain often starts as a more generalized pain or pain that is just around the belly button (periumbilical pain). With classic appendicitis, the pain then moves to the right lower quadrant over the area of the appendix. The pain is worse with movement, and the child may have a hard time getting comfortable. Other appendicitis symptoms can sometimes include constipation, diarrhea, and urinating more often than usual. Appendicitis symptoms usually worsen over 24 to 36 hours, afterward, without treatment, the child's appendix may perforate. Symptoms will likely then get worse, with an increase in abdominal pain and development of a high fever. That makes it important to seek medical attention whenever your child has right lower quadrant pain or you suspect that he may have appendicitis. 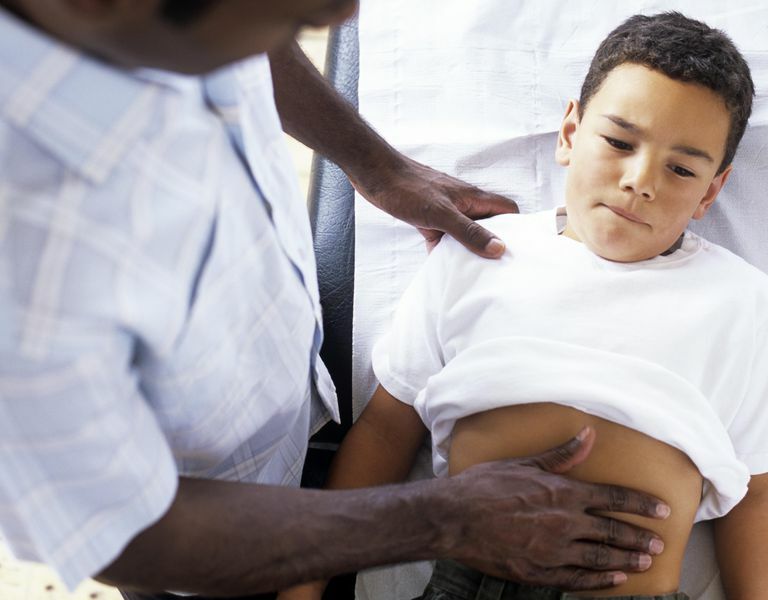 Your pediatrician or emergency room doctors can then perform a physical exam and perhaps do tests to try to figure out if your child does indeed have appendicitis, even when he doesn't have classic appendicitis symptoms. Abdominal pain followed by vomiting is commonly seen with appendicitis, while in most other causes of abdominal pain and vomiting—such as a stomach virus—the child will start vomiting first and then complain of abdominal pain. Children with appendicitis will likely also have an elevated white blood count. Other tests that can be helpful in diagnosing a child with appendicitis can include an ultrasound or CT scan, although they are not always necessary when a child has classic appendicitis symptoms. The treatment for appendicitis is an appendectomy, which is the surgical removal of the inflamed appendix. Although appendicitis is more common in older children, peaking in occurrence between the ages of 12 and 18 years, it can occur in young children, too. The diagnosis is more difficult, though, as kids this age often don't complain of specific right lower quadrant pain and may just be irritable. Marx: Rosen's Emergency Medicine: Concepts and Clinical Practice, 6th ed. Mosby Elsevier; 2006. Townsend: Sabiston Textbook of Surgery, 18th ed. Saunders; 2007.